The Royal Kingdom of Saudi Arabia has been in the news this week because of the killing of Washington post journalist Jamal Khashoggi. Khashoggi was murdered shortly after entering the Saudi consulate in Istanbul Turkey. Saudi Arabia says he died in a quote ‘fistfight’ but he was reportedly dismembered by an assassination squad. Khashoggi was an outspoken critic of Saudi Arabia's oppressive policies. While political freedom is rare in the kingdom, religious freedom is practically non-existent. My colleague Emily Jones is here now. Emily, you recently spoke with a religious expert about what life is like for Christians in Saudi Arabia. What did he Say? 사우디 아라비아 왕실에 대한 소식이 이번 주 내내 뉴스 거리였습니다. 왜냐하면 워싱턴 포스트 자말 카쇼기 언론인 살해 사건때문이죠. 카쇼기는 터키 이스탄불에 있는 사우디 영사관에 들어가자마자 살해당했습니다. 사우디 아라비아는 ‘주먹 싸움'으로 사망했다고 주장했지만 보고에 따르면 암살 조직이 그를 살해하고 시신을 토막냈다고 합니다. 카쇼기는 사우디 아라비아의 억압적인 정책에 대한 거침없는 비평가였습니다. 사우디에 정치적인 자유가 거의 없다면 종교적인 자유도 없다고 할 수 있습니다. 에밀리, 당신은 최근에 종교 전문가와 함께 ‘사우디 아라비아에서 기독교인들의 삶이 어떠한지’에 대해 이야기 나눴습니다. That's right George, David Currie of Opendoor says being a Christian could cost you your life. Recently on our worldview program, I talked with him about the cost of following Christ in Saudi Arabia. 맞습니다. 오픈도어의 데이빗 커리는 기독교인이 되는 것은 생명을 걸어어야 되는 일이라고 말합니다. 최근 우리 세계관 프로그램에서, 사우디 아라비아에서 그리스도를 따르기 위해 치러야 하는 대가에 대해 그와 이야기 나눴습니다. 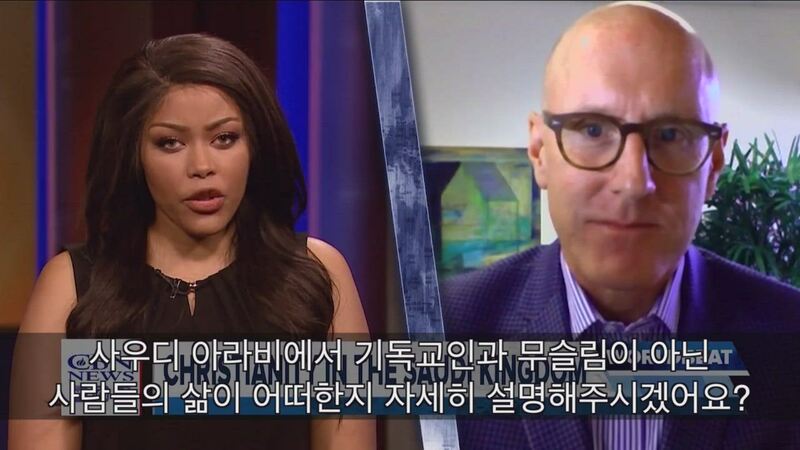 데이빗, 사우디 아라비에서 기독교인과 무슬림이 아닌 사람들의 삶이 어떠한지 자세히 설명해주시겠어요? Well there's a great squeeze on Christians that exist within Saudi Arabia. They control all the means of government. to have a Bible, so there's a total control of religious expression in Saudi Arabia. They only see things one way. That has made it number 12 on our research list of most difficult places for Christians, the world watch list. that teach Wahhabism and how they passed that theology of hate, funded it in Egypt, in Africa and elsewhere around the world. So Saudi Arabia is the central point in the spread of Wahhabism which has formed al Qaeda and everything else that has been part of this terroristic trend over the last several years. 사우디 아라비아의 기독교인들을 옥죄고 있습니다. 그들은 정부의 모든 수단을 장악하고 있습니다. 만약에 당신이 사우디 시민이라면 그곳에서는 성경을 복사할 수도, 가지고 있을 수도 없습니다. 사우디 시민이 아니라도 교회에 가고 성경을 가지는 것은 정말 어렵습니다. 그래서 사우디 아라비아는 종교적인 표현을 완전히 통제하고 있습니다. 그들은 한 방향으로 밖에 보지 못하는 것이죠. 그로 인해 기독교인들에게 가장 힘든 지역, 세계박해순위 12위를 차지했습니다. 사우디 아라비아는 문제가 되는 지역으로 지난 10년간 대부분의 이슬람 극단주의 교리에 상당한 영향을 미쳤습니다. 이슬람 고등교육시설에 와하비즘과 혐오하는 신약을 어떻게 퍼뜨리는지 가르치도록 자금을 지원했습니다. 그리고 이집트, 아프리카, 전 세계 다른 나라에도 자금을 지원했습니다. 그래서 사우디 아라비아는 와하비즘을 퍼뜨린 중심지입니다. 와하비즘은 알카에다를 탄생시켰고 지난 수년 간 테러의 흐름을 형성했습니다. David, how many Christians are there in Saudi Arabia? Do we even have official numbers and how many have converted from Islam to Christianity? 사우디 아라비아에 얼마나 많은 기독교인들이 있나요? 얼마나 많은 사람들이 이슬람에서 기독교로 개종했나요? Well, nobody really knows how many Christians are within Saudi Arabia because they're not allowed to express themselves publicly and go to church. We know that there are Christians there, we know that people want to have access to the Bible. whether that be through media forms, the internet, these kinds of things. But that is not because the Saudi government and culture has allowed it. They're fighting it with everything they can. So Saudi Arabia is a very difficult place for Christians. Again, not just within the borders of Saudi Arabia but the things that they're funding. That puts in great relief of the conditions we've had as an ally of the United States. We've been pushing them on religious freedoms. I think we need to go further clearly to see them improve religious expression within Saudi Arabia. think that's a path that Saudi Arabia can follow and hopefully that will be part of the discussion now as they're going through this tumultuous time in their political world. 사우디 아라비아에 얼마나 많은 기독교인들이 있는지 아무도 모릅니다. 공개적으로 드러내고, 교회에 갈 수 없기 때문입니다. 그곳에 기독교인들이 있다는 것을 압니다. 사람들이 성경을 갖고 싶어하는 것도 알고 있습니다. 미디어 형태, 인터넷, 이런 종류의 형식을 통해서 복음을 접할 수 있는 여러 방법들이 있습니다. 그러나 사우디 정부와 문화는 그것을 허락하고 있지 않습니다. 그들은 그들이 할 수 있는 모든 것을 동원해 싸우고 있습니다. 그래서 사우디 아라비아는 기독교인들에게 정말로 힘든 곳입니다. 사우디 아라비아 내 뿐만 아니라 다른 나라에 기금을 대고 있는 것을 보면 알 수 있죠. 미국의 우호국으로서 갖고 있는 조건에 숨통을 트게 해줍니다. 우리는 종교의 자유를 위해 그들에게 압력을 가하고 있습니다. 우리는 사우디 아라비아에서 종교적인 표현을 할 수 있는 날이 오도록 더 노력해야 할 필요가 있습니다. 그들의 이웃인 바레인은 열리기 시작했고 조금 더 많은 종교적 표현을 할 수 있습니다. 그 길이 사우디 아라비아가 따를 수 있는 길이라고 생각합니다. 그들이 정치적 세계에서 격동의 시기를 거치고 있을 때 논의의 장에서 이 문제가 언급되길 희망합니다. the gospel? How difficult is it there and what ways is the church spreading the gospel in Saudi Arabia? 사우디 아라비아에서 기독교인이 된다는 것은 매우 위험하다는 것을 알고 있지만 복음을 전하는 것은 어떻습니까? 얼마나 어렵나요? 그리고 어떠한 방법으로 교회는 사우디 아라비아에 복음을 전하고 있나요? Well in many parts of the Muslim world, as is the case in Saudi Arabia, you have an underground church where believers are sharing person-to-person and Bibles are being passed on in secret. and in other places around the World. That's the key thing. I think what people forget to understand Is, most people don't have the freedom that we do here in the United States. That would certainly be the case in Saudi Arabia if you own a Bible, you could be killed, you could be ostracized from your family, you could be totally cut off. The Saudi government has created a system that squeezes the life out of the church. That's their plan anyway. But churches do work underground in secret ways. An underground church exists throughout the Middle East, that would be true in Saudi Arabia as well. 무슬림 세계의 많은 곳, 사우디 아라비아 경우에도 지하 교회가 있습니다. 지하교회의 성도들은 개인적으로 직접 만나서 교제하고 성경을 몰래 전달하고 있습니다. 성경을 읽도록 장려하고, 사우디 아라비아와 다른 나라에서도 믿고 있는 것을 스스로 결정 할 수 있도록 격려하는 많은 방법과 단체들이있습니다. 대부분의 사람들은 미국에는 있는 자유가 그곳에는 없다고 잘못 이해하고 있다고 생각합니다. 만약 사우디 아라비아에서 성경을 소유하면 살해당하거나 가족으로부터 배척당하고, 완전히 단절 될 수 있습니다. 사우디 정부는 교회의 모든 생명을 옥죄는 시스템을 만들었습니다. 그것이 그들의 계획이지만 교회들은 지하에서 몰래 그들의 사역을 하고 있습니다. 중동 전역에 지하 교회는 존재합니다. 사우디 아라비에도 존재하는 것이 사실입니다.